BlackBerry 10 brings a slew of new and exciting features. 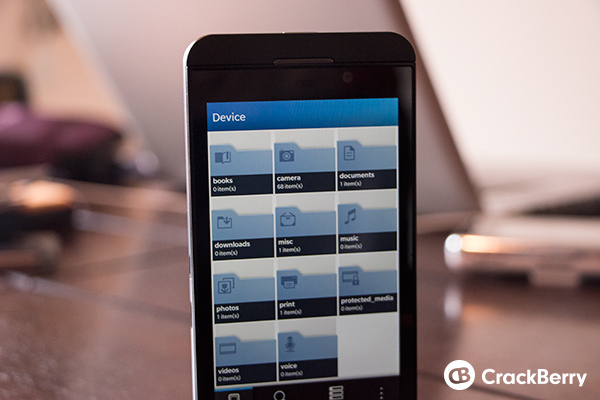 One that many have been wanting for quite a while is a built-in file manager. Rather than have to download a third-party app to manage files on BlackBerry 10, it comes with a native app to do just that. It's extremely useful for managing all of the files on your device but can be a bit daunting if you're not sure how to use it. 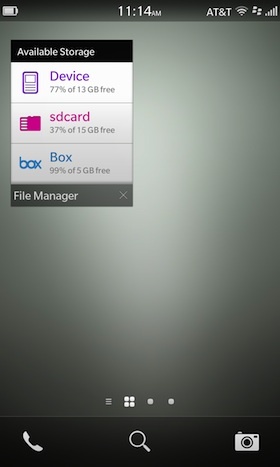 Stay with us and we'll take a look at how to use the File Manager on BlackBerry 10. 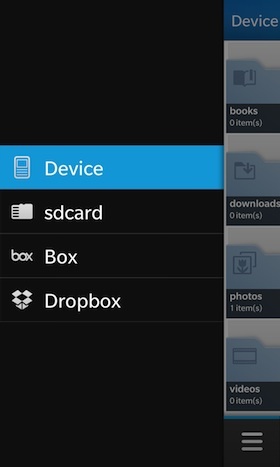 In the File Manager you have the option to manage media on your device storage, SD card (if inserted), Box and Dropbox (if connected). To change between them, swipe right and choose from the navigation pane. When you first open up File Manager you'll be at the root of your device and see a list of folders. From here you can browse all the files on your device or swipe right for the navigation pane. You can then change to your SD Card, Box or Dropbox accounts (if they are already setup - if not they won't be listed). When browsing simply tap a folder icon (or a name if you're in list view) to view the folder contents. Tapping the overflow icon (3 dots) when browsing will give you options to search, change to list view, sort folders or select multiple folders. Search brings up the search dialog so you can search all the files on the selected media (in this case the device storage). List changes the folder grid view to list view. Sort allows you to sort folders by name, date, type or size. 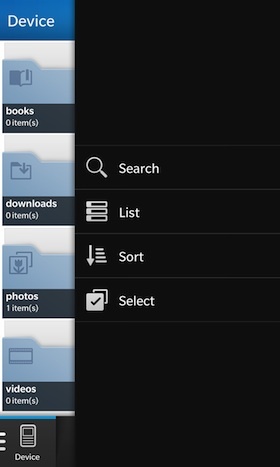 Select lets you choose multiple folders which you can then copy. If you long press (tap and hold) on a folder you can view the folder properties or have the option to copy or select more folders from the action menu. When in a folder you can view all the files contained within. By performing a long press on a file, you have plenty of tasks that can be done incuding copy, move, rename, view properties, ZIP, share and delete. 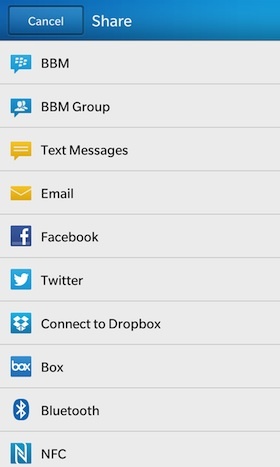 Share - share a file to SMS, BBM, email etc. Select - select multiple files for copying, moving etc. Using the overflow menu you can also perform tasks like adding a folder, zip all, change to list view, sort and select more. Copying both files and folders works in the same manner. You can copy items individually or in groups by selecting more than one at a time. 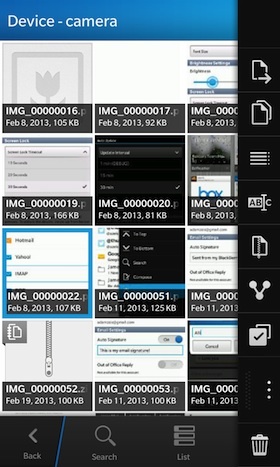 Navigate to the folder where you want to paste the file and tap the Paste button. This can be on the currently selected media (device in our case) or your SD card, Box or Dropbox. This works the same for both files and entire folders. The same goes for copying multiple items - you just have to select them first. To copy multiple items, tap the overflow icon then choose Select. Navigate to the folder where you want to paste and tap the Paste button. Moving files and folders works exactly the same as copying. Just use the Move action instead of Copy. To view the properties of an item, long press and choose Properties from the action menu. The properties of the file or folder will be displayed. Properties include name, type, creation date, modififed date, size, location and permissions. 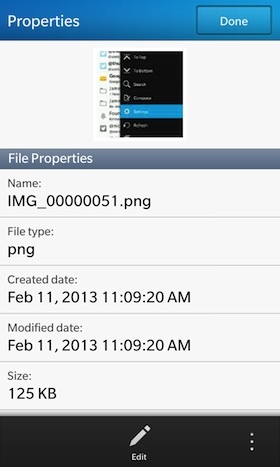 You can also rename a file from this view by tapping the edit icon on the bottom. To rename a file of folder, select the item and tap the overflow icon (or long press) and choose Rename from the action menu. Enter a new name for the item. 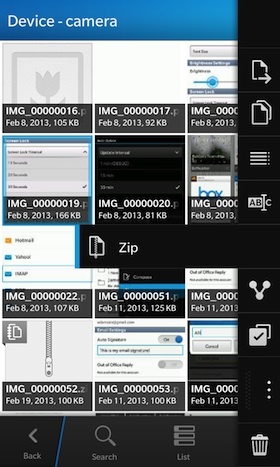 To create a ZIP file for one or more items, tap the overflow icon and choose Select. 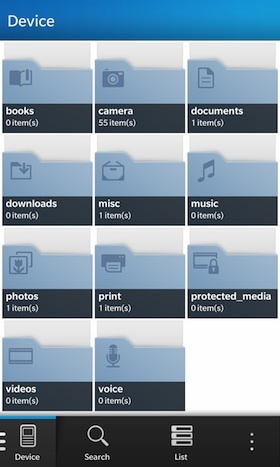 Tap the item(s) you want to add to the archive, then choose Zip. The archive will be created in the same folder and you can then move, copy or share it as needed. To share one item simply long press and choose Share from the action menu. To share multiple items, tap the overflow icon and choose Select, then tap the items you want to share, then choose Share from the action menu. 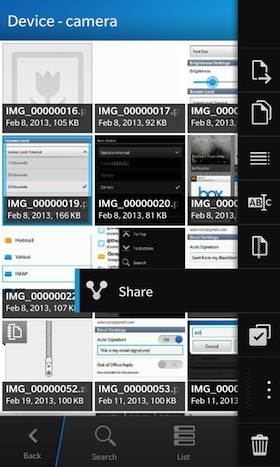 After choosing Share, you can share the items by text message, BBM, email, NFC, Bluetooth and more. A cool thing to note is the Active Frame for File Manager. The Active Frame shows your current storage for all of your media including SD Card, Device, Box and Dropbox (providing you have them connected).